Oh the “traps” or Trapezius muscles and their many exercises. I was in the gym a few days ago and saw a guy pounding away on the shrugs. He was doing shrugs with a 110lb dumbbell in each hand. He was lifting the weight a total of 1 inch on each rep. The weight was so heavy; he couldn’t do the movement properly. Not only that, but he was trying to heave so much weight, he was exhausted after only four unsuccessful reps. So I asked him why he was doing what he was doing. He said, “Traps are where it’s at!” I tend to agree with him. The “traps” or Trapezius muscles are above your collar bone on top of your shoulders and extend from your neck to the tip of your shoulders. If your traps aren’t developed just be glad they they can be the biggest improvement in your overall look, and grow really quickly. With well developed traps, you will raise the bar from looking like a regular Joe to looking like a body builder. I know you probably think shrugs are the only way to build huge traps. How’s that working out for you? I’m guessing not too well, otherwise you wouldn’t be reading this. Well, shrugs are an effective core exercise to build traps just like bicep curls are to build biceps, but there are other things you can do to get a good trap workout. Below is a routine I have developed to get you on your way. I had to include those, they really are the start to successful trap training. I know you know how to do shrugs, but here are a few tips. 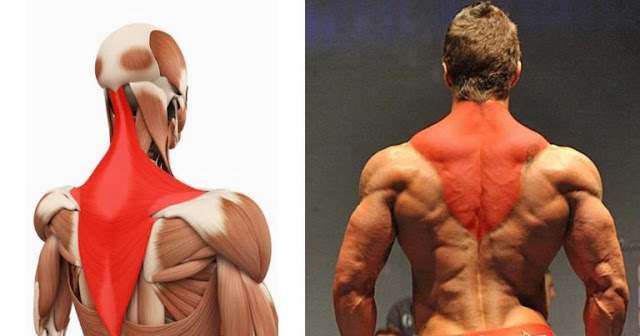 When you fully contract your traps they probably hit the sides of our neck, I know mine do. To fully contract, or lift your traps, push your head forward as far as possible. This will keep them from squeezing your neck and making it feel like you are going to squeeze your head right off. Be sure to contract fully and hold for two seconds before lowering the weights slowly. You could also sit down to ensure proper form. This one is tough. First, you need to flare your traps while holding the dumbbells. Next, simply perform a lateral raise. This is just like a normal lateral raise where you lock your elbows and lift the dumbbells directly out to your side to where they are parallel with he ground. The lateral raise usually hits your deltoids, but when you flare your traps it concentrates the movement to them for maximum isolation. Start with 12 to 15 reps and don’t use too much weight so that you will maintain proper form and get used to the movement. This is the same movement as the lateral raise, but you want to bend at the waist at about a 45 degree angle. This is great because it will hit the back of your traps. The rear traps are impressive because from behind you will look even more built, defined and strong. Throw these exercises into the mix and watch your results go through the roof!